Sito’s book is a celebration of the works from legendary animation artists from around the world. Twelve Academy Award winners, five Emmy Award winners. From legendary animators from Hollywood’s Golden Age, to modern masters. Not only does he demonstrate examples of their works, but he also includes their favorite personal recipe, and an anecdote from their professional lives that relates to food. - A rare look behind the scenes of some of animation's most memorable films. 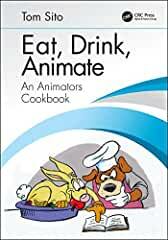 - Usable recipes you canmake yourself, tested and adapted by Rebecca Bricetti, former editor for Stewart, Tabori, & Chang (Glorious Food ) and Robert Lence animator and gourmet (Toy Story, Shrek ). - Never before seen photos and illustrations. - Anecdotes from behind-the-scenes of some of your favourite animated classics.